40 years ago, “Cooley High” was born. The film arguably contributed to the changing direction of Black movies in cinema, freeing Black creatives and consumers from the constraints of the “Blaxploitation” era. Eric Monte’s classic has laid the foundation for several young Black writers and directors to borrow from his playbook. From John Singleton’s “Boyz N The Hood” to the newly released film, “Dope,” the remnants of “Cooley High” are apparent. JET sat down with legends Eric Monte, Lawrence Hilton-Jacobs and Robert Townsend for a reflection on the film, its influence and the evolving industry today. JET: Forty years! Wow. How does it feel? Lawrence Hilton-Jacobs: I didn’t have grey hairs then I can tell you that much that’s what it feels like (laughs)! Eric Monte: I’m alive (Laughs)! Robert Townsend: This thing is beautiful. I mean the film is a powerful film. It gives you a slice of life that you rarely see on screen. So when people think about Cooley High, it’s on everybody’s top ten list of classic movies, you know they wanna say Black movies, but I think it’s just a great movie overall. It gives us such an authentic look at the 60s, and it starts with the script and then the actors took it to a whole other level. I’m just glad. I had two lines and I’m proud to be in it. JET: Did you imagine that the film was going to be so legendary? Eric Monte: YES! (everyone laughs) Absolutely. I told [the producers] that this was going to be the banker. They said, “Are you crazy Black man?” But I knew it. Lawrence Hilton-Jacobs: (laughs) I was just an actor happy to have a job. I knew it was a good script and you only hope for the best but you just don’t know. I mean at that point, I was 21 and in the business maybe 7 years then. I just knew that this was a special movie. When I read the script I said, “Wow. This is a real eyes film.” It comes to a point that makes sense and it kinda mirrored my life at the time because I grew up in NYC and it reflected a lot of my own background. Robert Townsend: You know for me…I was living in Chicago at the time and back then when I was a kid, I loved movies so I watched all kinds of classic movies on TV and then when the Black exploitation movies came out, you had all those movies from Disco Godfather to Blacula to The Mack to Superfly. When I saw Cooley High, I said, “I ain’t never seen a movie like this!” Because all the movies were like, “Aw you jive sucka!” You could tell that the writing was bogus and wasn’t real. So even though I was in the movie, when I went to the premiere at the Chicago Theater, I was sitting there going like, “This is my life, but you could do that with a movie?” The music. They brought in the Motown soundtrack…I didn’t know that the word was classic, but I knew that this [film] was special in my heart. 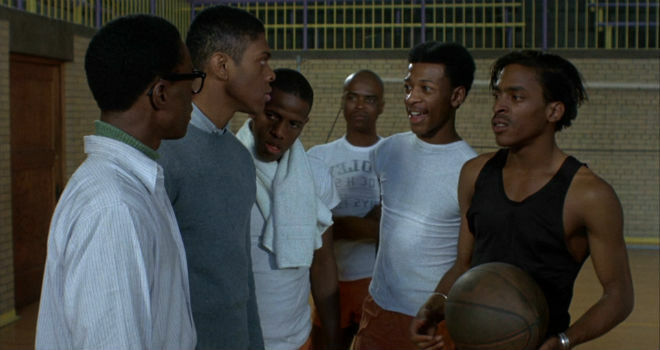 JET: Speaking of films then and now, what’s this generation’s Cooley High? Lawrence Hilton-Jacobs: It’s a couple of movies. Recently, the movie Dope. Boyz in the Hood without a doubt. Even John Singleton who wrote and directed it will tell you that himself. And I take that as a flattery to Eric Monte the writer because it influenced people to want to beget an idea from that. And again it’s about being part of a community. That’s lost these days. Having a sense of community, comradery, natural love for thy neighbor and as corny as that may sound, that’s a real thing that’s kinda gone now. And this movie introduced that and now the movie Dope brings that. JET: You’re behind iconic sitcoms like The Jeffersons, All in the Family, Good Times…what do you imagine a Cooley High remake looking like? Eric Monte: People say, “Make another one.” I don’t care. If they want to put the money behind it then yeah. But it wouldn’t beat the original! This one is the best one. If they say, “make another one” I could do it, but this one is just the best. Lawrence Hilton-Jacobs: Oftentimes when trying to do a remake of a film and I understand why people might want to do that because it’s a proven idea that’s been out there and you have a pattern to follow….but what you’re doing a lot of times is trying to repeat what’s already been done with that feeling. The feeling of the first time is how you felt and that’s the magic. So to try to go back and say, “Now we want to try to play that [role] now” it wouldn’t be the same as when it first happened. It would just be too extreme. JET: Robert, in terms of the industry, are we still “Hollywood Shuffling?” What’s changed? Robert Townsend: You know, it’s the best of times and it’s the worst of times. On one hand, you got Scandal and How to Get Away With Murder. You’ve got some of the most prolific show-runners in Shonda Rhimes. You have a BET, a Centric, a TV ONE, you know so there’s a lot of content. Do we need more? We always need more and so the thing for me is that I think it’s all about quality control because against all of that, you have all of these reality shows that are showing the worst elements of people of color. You got all of these beautiful women that call each other out of their names and fight with each other. So my daughters are watching these images and they’re kind of confused about what it means to be a woman of color. So when I see them doing whatever their thing is, I’m kind of hurt. We’re in a weird kind of place because kids are being fed those images daily. So if you eat it daily, you’re gonna want to perform it. That’s how you treat a man, that’s how you handle conflict, you get in somebody’s face and want to drink and fight. Images are powerful. Like when I did The Five Heartbeats. There was a sense of family in that film. It’s not about five different men dealing with five situations. Lawrence Hilton-Jacobs: I like how you got that plug in there (everyone laughs)! Robert Townsend: (screams) Five Heartbeats it’s coming out on Blu Ray (laughs)! As a matter of fact, Larry and I are doing a new movie July 12 on Up TV channel called Playing for Love! JET: (Laughs) So how did Cooley High change you personally/professionally? I know the film must have had some kind of impact on your lives. Lawrence Hilton-Jacobs: Oh to this day it still changes me! Cooley High was just a wonderful wonderful gift that was given to me through two wonderful men. One is Eric Monte the other one is Michael Schultz the [film’s] director. Even with Michael, I never auditioned for the movie. I went and met with him and he just talked to me about it and then we went walking in New York City. He asked me more things about the movie and ironically, we got on the corner of 46th St. and 7th Ave. and right behind me Claudine was playing, which is a trip. But it changed my life all the way. It opened doors for me as an actor. It made me respect the idea of a story and telling that story. Being in Claudine and Cooley High back to back, at the time for me in the middle of Blaxploitation films, to do those two iconic movies that had nothing to do with that, how lucky can one be?! I take that as beyond a blessing. Eric Monte: Cooley High…I did that because I couldn’t sing (laughs). So I came up with something else. I’m joking (laughs). But it’s the first movie that I ever did. I mean, it can’t get better than that!